On this day, 8 of October, 123 years ago one of the greatest poetess in Russian literature – Marina Tsvetaeva drew the first breath. She was born in the intelligent family: her father Ivan was a famous philologist, art critic and a professor of Fine Art in Moscow University and mother Maria was a pianist. Marina Tsvetaeva begun to wrote here first poetry being a 6 years old child, her poetry was written not only in Russian, but also in French and German languages. Her mother was terminally ill with tuberculosis and that time was believed that a change in climate could help to cure the disease, so young Marina spend quite a long time in Italy, Switzerland and Germany; lately she studied French literature in famous Sorbonne University. Tsvetaeva published the very first poetry collection in 1910 on her own money..
Russian Civil war (1917-1922) was severe time for the poetess and here own family. She rejected Russian Revolution and wrote the cycle of poems about the war, glorifying those who fought against the communists. While here husband joined the White Army (anti-communist), she had no support and lived in starvation with her daughters. In 1922 Marina Tsvetaeva left the Soviet Union and moved to Berlin, lately her family lived in Prague and finally settled in Paris. Unfortunately, living abroad didn’t made here life easier, they lived in poverty and were homesick for Russia. Tsvetaeva did whatever she could: began to write more prose because it made more money than poetry. Meanwhile, her husband and daughter were involved in NKVD (predecessor of KGB), and when French police interrogated Marina Tsvetaeva, she was shocked about news that her husband was a spy. Furthermore, police implicated here son in the murder of former Soviet defector. Finally, in 1939 she returned to Russia.. Returning to the apple pie recipe and its name. It’s being said that such apple pie was served in the house of Marina Tsvetaeva and her sister Anastasia. Young Marina spent a lot of time with famous poets and writers on the literary evenings, and it’s been known that she served an apple pie to her visitors. I really want to believe that she really had an opportunity to participate and enjoy such evenings, where this tender and delicious apple pie was served. At least there was something striking and good in her life. You can make the dough one day ahead and keep it in the fridge. For the dough, in a large bowl, add butter, sift the flour and mix until mixture resembles crumbs. Add sour cream. Dissolve soda in vinegar or lemon juice and pour in the dough mixture. Mix to combine. Knead a dough a bit, shape into a disk, cover in plastic wrap and put in the fridge for 30 minutes. Take the baking tin, grease it and line with baking paper. Roll the dough into the circle to fit the baking tin. Put the tin into the fridge. Peel (optional), core and thinly slice apples, sprinkle with lemon juice. In a bowl, with electric or hand whisker beat sour cream with egg and sugar. Add vanilla, if using. Sift the flour. Whisk to combine. Take the baking tin with dough from the fridge. Arrange apple slices. Pour over the sour cream mixture. Bake for 20 minutes. Then reduce the heat to 180C and bake for 25 minutes more. If the top begins browning too much, cover it with a foil. Allow the pie to cool completely in the baking tin. Then carefully transfer the pie onto the serving plate. Slice and serve with cup of hot tea. The remaining pie cover with a foil and keep in the fridge up to 2 days. The pie will be even better on the next day, as the cream becomes thicker. Oct8October 8, 2015 • By milkandbun • This entry was posted in Baking, Cakes, Desserts, Pies, Russian cuisine and tagged apple cake, apple pie, apples, baking, cake, cooking, dessert, food photo, food photography, food styling, photography, photos, recipe, Russian, Russian apple pie, Russian cuisine, Russian food, Russian food history, Russian recipe, sweet, Tsvetaeva apple pie. Bookmark the permalink. Wonderful story and pie, very interesting life of Marina! 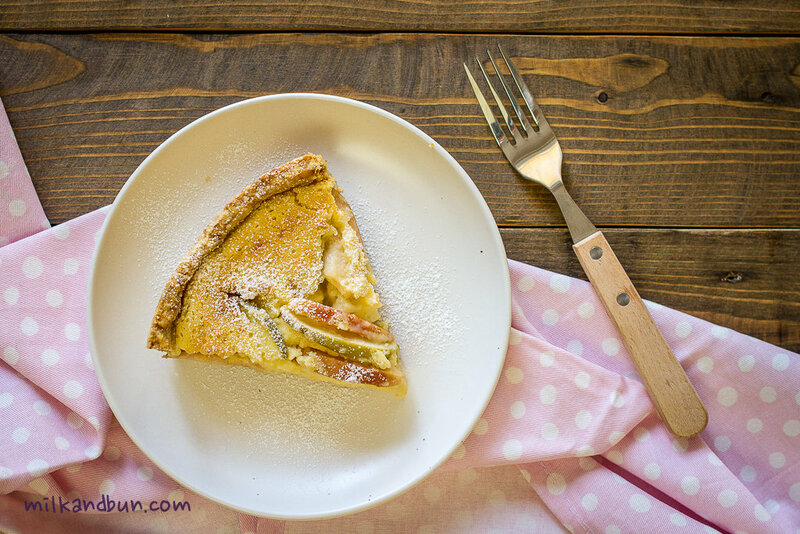 The pie looks so delicate and tasty! What a great story. I’ve never heard of Marina but now I want to know more about her. Apple pie is my all-time favorite dessert and I’ve made a zillion of them but never with sour cream. I am so eager to try it. 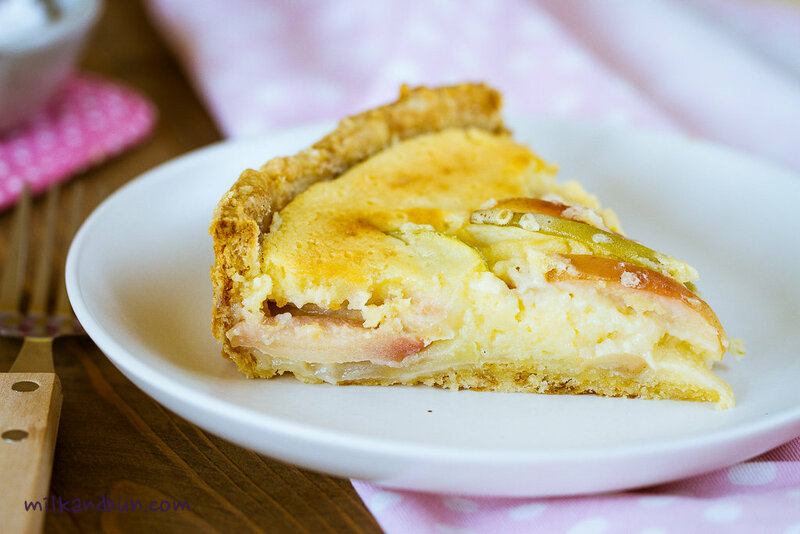 I LOVE this post Mila – please do more like this, with the interesting Russian history, your writing is beautiful, and although I do not like apple pie, this one looks wonderful and I am going to make it when the apples come into season. I am also going to find some of Marina’s poems in French and find out more about her life in Paris. This story is fascinating, Mila. I’m totally intrigued by your culture and customs maybe because your writers wrote literary masterpieces. I love the idea of your apple pie and this is a cake that my family would truly enjoy. Thanks a lot for your nice comment, Francesca! I have read Nobokov, Tolstoy, Dostoevsky and – more recently – all the books of Irene Nemirovsky. I love each page! Lovely post Mila. A joy to read. And I really like your apply pie. Very unique with the sour cream in both the pastry and the filling. I love reading too! What was the most recent book you read? Fabulous story! Go visit Lindy! Yes, I know, but not the book. 🙂 What’s the story telling? is it a novel? What a great post, the more I read it seems the less I know. Very interesting. Love the pie!!! I have been meaning to make apple pie for a while. This looks perfect! Thanks for your warm comment, Anna! I hope you will make this pie? 🙂 You may find many other Russian recipes and its stories (you need to click Recipe Index on the top of the page). I totally love this recipe. And the photos are great! Such a hauntingly beautiful story!! It’s sad to know that there were people out there who have had to live through such hardships… I would love to read some of her poems! But I know I definitely will enjoy this apple pie! it looks absolutely beautiful! Yea, her life was complicated, but thank God we have her poetry and could enjoy it! 🙂 Thanks for the comment, Dini! Love this pie! It’s like having custard and pie together. Might have to try it as I’ve never come across anything like it. Hehe nooo I made it without cottage cheese))) I think with cottage cheese it will more like cheesecake, and here it was like custard)). Hope you will love this cake anyway☺️Can’t wait to read your opinion after eating! It came out perfect, I took a bite while still warm, it changed texture a little bit, but still a great versatile recipe 🙂 Thank you my dear!